In just 48 hours, things are going to get real bloody. This weekend, F This Movie! switches over for Scary Movie Month, when we celebrate horror for all of October. In addition to tons of horror-themed content and bonus podcasts, it will also be time for our annual Scary Movie Challenge, wherein we try to collect as many seven-word reviews from everyone as we possibly can. There has been some discussion in the comments about whether or not it's cool to comment on other people's seven-word reviews; in the past, we've frowned on that kind of thing because we wanted to keep an accurate count of just how many reviews we ended the month with. Having listened to many of you, I've decided that we're far enough along in the SMC experiment that no, it doesn't really matter how many seven-word reviews we get. I suspect it will be in the thousands like it has been the last few years, which is great. And if it will make it more fun to be able to comment and discuss each other's reviews, I say go for it. So it is spoken, so it is done. To get yourself ready for the best month of the year, here's our annual #ScaryMovieMonth primer, collecting all of our horror-related content. There's a lot of it! You've got two days to soak it all in! Will we get a place to discuss Blade Runner 2049? I'm so excited for SMM, but I have to say a Blade Runner sequel beats it out. now that we can talk about it, i can say that Blade Runner is a very fine sequel. much better than what we would expect for such a thing. Denis Villeneuve clearly knows and love the original movie (even if he said he prefer the theatrical cut). though, i never liked Ryan Gosling, and this movie is not helping, but that's just me. other than that, some of the beats of the original movie are repeated, but that's to be expected. so as i said, it's a fine sequel to a movie that didn't need one. My eyes widened the further I scrolled. So excited for SMM 2017! I imagine it's a bit of a haul from where you are, but there appear to be several Toronto-area screenings, according to Synapse's schedule. if i had a car i'd think about it. it is about 5-6 hours drive, i think. That's not fair, that it's showing in Kitchener and London, Ontario, but not in Ottawa or Montreal. You could always contact your local repertory theater and ask them to talk to Sypapse/Fox to arrange a screening! I imagine both companies are eager for any venue willing to do a showing to participate. You never know Kunider - I saw it in Halifax (albeit there was a programmer obsessed with the film so that had a lot to do with it) - hope you get a chance - it was fantastic! yesterday i went to the used dvd store and got the blu-ray for Nightmare on Elm Street, which i saw years ago so i barely remember it. and i got Crimson Peak, which i never saw, but hear it's beautiful. and a couple of weeks ago i got House of 100 Corpses, which i also saw a long while ago, so i'm due for a re-watch. i'll probably add a rewatch of The Dark Crystal, because the Skeksis are scary as heck. I'm going to screen Martin and The Funhouse outside of my house this Sunday on the projector. Thank you for this wonderful resource! I've been going back and listening to old SMM podcasts (mostly massacre reports and franchise rundowns) and getting more and more excited about October! I can't believe it's almost here. That year flew by. I went for it last year. Watched the entire Nightmare series, Dead series, Texas Chainsaw series, Friday the 13th series, Child's Play series, and many more. It's hard to not go right back to some favorites, but I'm hoping to find some hidden gems this year, branch out into some new territory. Gotta represent some T Hoops, gotta have the family get together, I showed them Texas Chainsaw 2 last year, I think they're ready for The Funhouse! Friday V with F the Movie commentary is on the list, been waiting for that one. It's an exciting time, glad to be apart of it. I'm so happy that Xtro made the primer list as part of SMM which I feel it is. Ps I have a nice SMM surprise plotted. Activated. Realized. And in motion that will be revealed every very soon. 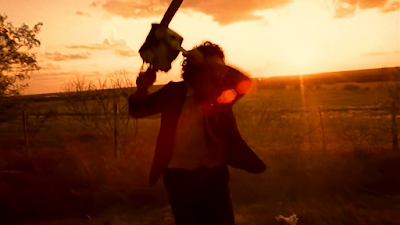 Just in time for SMM, Texas Chainsaw Massacre 2 is coming to Amazon Prime in October. Anybody else planning on getting started right at midnight tonight?? :) I am AMPED! Oh yes. Got my first 4 picked out already. Tried and failed to take a nap today so I can make it to 6 am. Oh well. What are you starting with? Yup I'm in on the 12:00am tee off! Doubt I'll get in as many as E.S.A.D.D.. I'm thinking The Fog and Exorsist 3. Followed by something's less classic on SunDAY. Happy SMM! This is incredible! Thank you for this and all the great content! Gabby! Hope all is well. Happy SMM! Hey Cullen! I have been here, just been a bit quite in the comment section. I plan to be more like my vocal self again though! Hope all is well with you too, Happy SMM! I've heard mixed things about all 3 so hoping this isn't a big mistake! On my way to see Candyman last night, I relistened to the first Massacre podcast, which was great for so many reasons. For starters, it was also my first Massacre (which means that this year’s Music Box of Horrors will be my seventh. Jeez), but it was also great to hear of the “F! Horror Movies” challenge at “fthismovie.blogspot.com”. Oh, how much you guys have grown (started the following year on my way home and you guys talk about listener Heath Holland and meeting Adam Riske for the first time)! I left before Fright Night because my then-girlfriend was running the Chicago marathon and I had an obligation to watch her go by (before going back to her brother’s apartment, falling asleep on the parkway, and being woken up by a cop), but besides that, I stayed the whole time. However, I have zero recollection of Rabid even playing. Maybe I slept? I don’t know, but it was a surprise to me all these years later. Anyway, happy scary movie month!